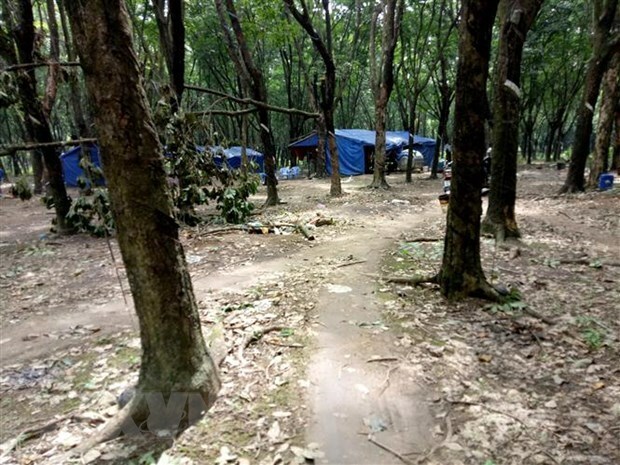 Phnom Penh (VNA) – The Vietnam Rubber Group (VRG) has reported that it tapped over 25,400 tonnes of rubber latex from its farms on a total area of 22.64ha in the Cambodian province of Kampong Thom in 2018. During a ceremony reviewing the VRG’s rubber tree planting project in the province on March 27, the group said its eight subsidiaries operating in Kampong Thom sold 25,766 tonnes of latex the same year, earning profit of more than 39.4 billion VND (1.7 million USD). The report said the Vietnamese rubber firms have contributed to generating jobs in the Cambodia province; building roads, schools, medical stations and water wells in the surrounding areas; and donated millions of USD to the Cambodian Red Cross. This year, the VRG will begin to harvest latex on some 31,000 ha of rubber trees and employ more than 6,500 workers in the country. Vietnamese Ambassador to Cambodia Vu Quang Minh asked provincial authorities to assist VRG in the supply of professional guards, allow the use of workers during weekends in line with Cambodia’s Labour Law, and check the legality of rubber latex points of sale near the project’s area, contributing to improving local economic growth. He also urged the province to provide all possible support for Vietnamese nationals in Tonle Sap, Kampong Thom province in conducting paper works to be employed by VRG. Governor of Kampong Thom province Sok Lou pledged to deal with issues within his authority and report VRG’s proposals to leaders of Cambodian ministries and agencies concerned.